Being normal is vastly overrated. This week, we’re throwing it back with fashion inspired by, IMO, the best Halloween-themed DCOM: Halloweentown. 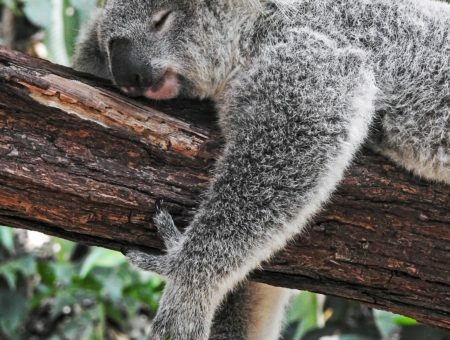 If you haven’t seen it (where have you been? 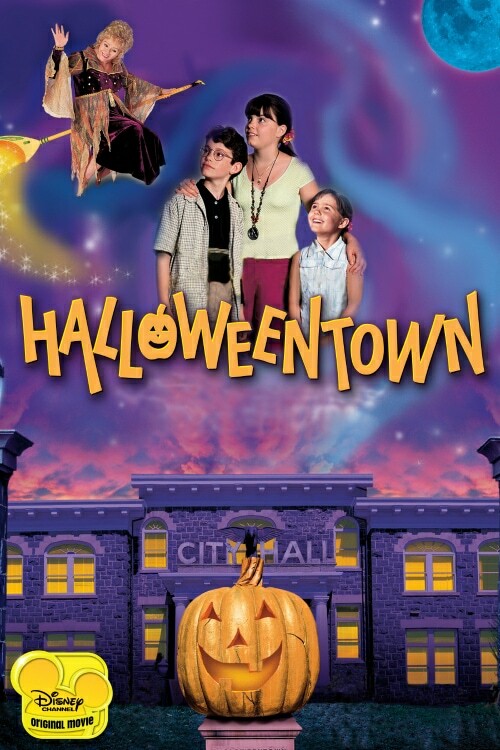 ), the kids’ flick follows Marnie, who, after discovering she’s a witch, travels to the magical realm of Halloweentown to help her grandmother fight an evil force. Sounds kind of corny when I write it out, but Buzzfeed breaks down why it’s so iconic much better than I ever could. Below are three chic, totally wearable fall outfits inspired by the characters of Halloweentown. Scroll down to check ’em out! For a look inspired by our fearless heroine and lover of all things weird, start with the basics: dark red skinny jeans and a textured white top. Layer on a pumpkin-colored jacket that’s reminiscent of the cape Marnie wears, then step into some Benny-the-skeleton-cabbie-esque studded skull loafers. Don’t forget the “witchy” jewelry. In this case, it’s a statement-making pendant necklace and celestial drop earrings. 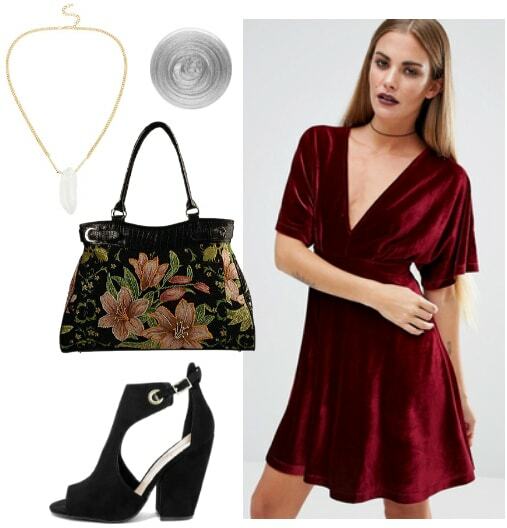 Make Grandma Aggie’s BAMF witch attire work for a night out by choosing a luxe, on-trend red velvet dress and suede peep-toe booties. Stash your belongings in a tapestry bag similar to Aggie’s Mary Poppins-like satchel, and string a large quartz crystal around your neck. Finally, add a bit of magic to your mani with a glitter-packed reflective nail polish. Halloweentown‘s big bad is actually quite frightening for a movie meant for children, but I’m loving the idea of an outfit based on his billowing robes. Since this villain wears head-to-toe black (shocker! ), start with a long, flowy spaghetti strap dress. 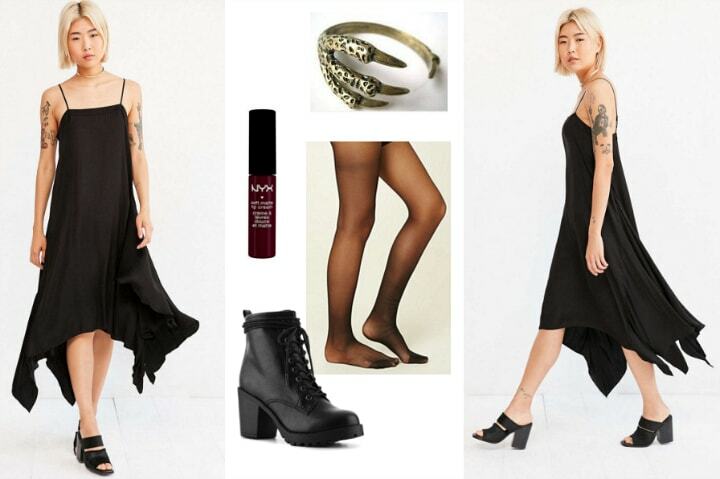 Add sheer tights and lace-up combat boots, then adorn your wrist with a claw-shaped cuff similar to the talisman Kalabar so desperately wants. The finishing touch? A dark, mysterious lip color, of course. Have you seen Halloweentown? Would you wear any of these outfits? What’s your favorite DCOM? Leave a comment below and tell us your thoughts.